As a member of the Scraputante Design Team, I had fun creating this mini album using the awesome kit I received this month. 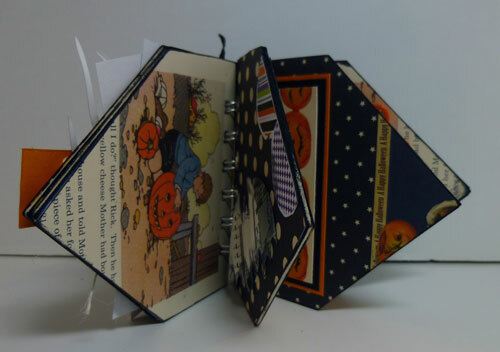 This kit had Jenni Bowlin papers, twine, die cuts, buttons and more. I created this mini album from coasters I picked up at a local restaurant. I covered each coaster with pattern paper and inked the edges before binding them together with my Bind-it-all. Decorating the front cover was so much fun with tickets, spiders and a ghost all tied together with twine under the title. I added little embellishments on the interior pages - buttons, twine, pieces of pattern paper, etc. With the paper selections, this was the cutest mini album to create. Good morning Steph here and I absolutely love this stamp from Heartfelt Creations. It's so peaceful. 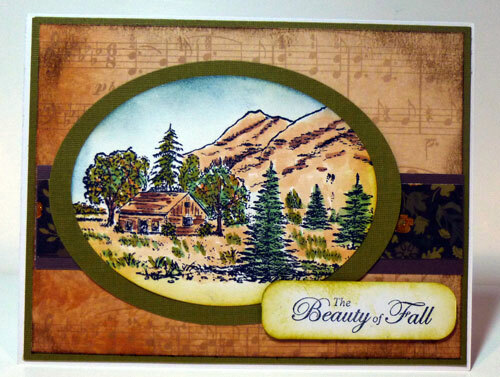 I chose to create a fall scene, but think how lovely it would look with with summer colors! I stamped the image and colored it with Copic Markers. Once I die cut to the oval shape, I used Crushed Olive Distress Ink and Tumbled Glass Distress Ink to add some color around the image. 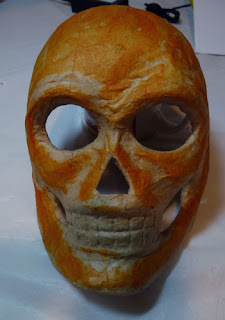 I lightly sponged on both colors with an inking tool, then darkened the colors around the outside edges of the oval. Once done, I matted the oval with green cardstock then assembled my card. The sentiment is from Justrite Stamper's Nature's Nested Sentiments. I stamped it with black ink and, after cutting to size, I inked the edges with Crushed Olive Distress Ink. Joy Foam Pads provided a little dimension under the sentiment. Here's today's post at Classy CardsnSuch. 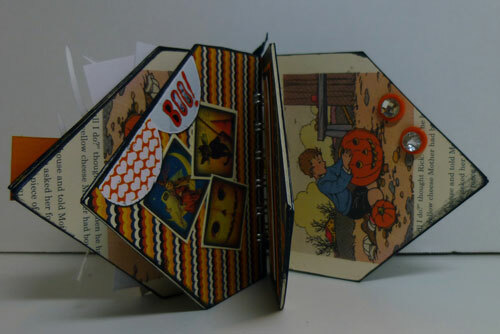 I created a 5 1/2" square card and used my Scor Buddy to create the perfect fold. Using several pattern papers from Simple Stories Handmade Holidays 6x6 pad, I created the card layers. The stamp is part of a 2 piece set from Heartfelt Creations called Scenic Combo and I absolutely loved coloring it with Copic Markers. Since I wanted it to fit the front of my card, I chose to cut it into an oval shape, but made sure to keep the trees in tact in the upper left. Using Spellbinders Labels 18, I created a mat for the image from cardstock. The sentiment is from Justrite's Nature's Nested Sentiments and is just the perfect mate to this image. The image was added with small Joy Foam Pads while the sentiment was added with large Joy Foam Pads. 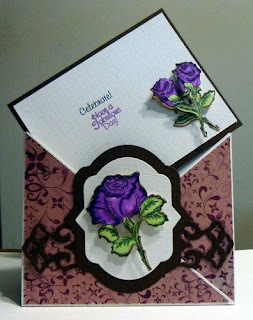 This is my post this week on the Classy Cards n Such blog. 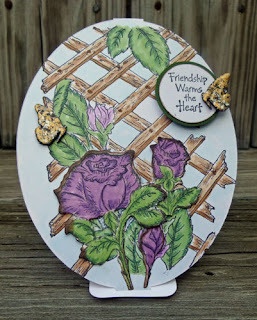 I absolutely love the large rose stamp from Heartfelt Creations - it's such a pretty stamp. I used an assortment of Copic Markers to color the rose and the leaves, then used brown ink around the edges after I die cut it. 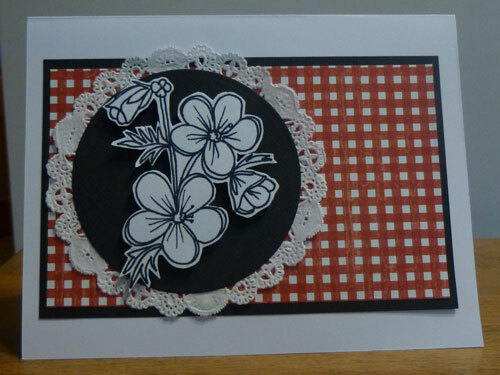 I created a criss cross card which is approximately 5 1/2" x 4 1/2". Using my Scor Buddy made it so easy to get the perfect score lines. To dress up the front, I die cut a Spellbinders border die and then used the Nested Oval Medallion Labels as the base for the rose. 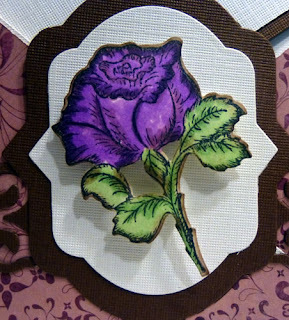 The rose was added with Joy Foam Adhesives for a 3D effect. 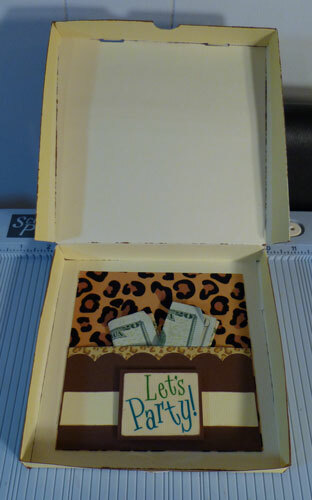 My interior card is 4 1/4" x 5 1/4", was cut from brown cardstock, then white cardstock was added on top using Scor Tape. 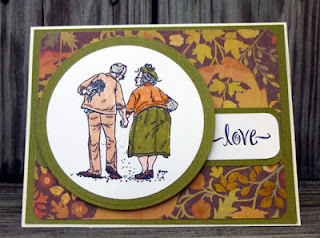 The sentiments are from Topsy Turvey Cakes by JustRite Stampers. 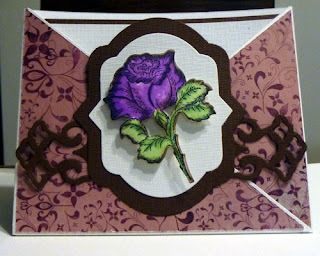 The two colors of ink coordinates with the roses which I added to the right side of the card with Joy Foam Adhesives. A close up of the rose. This is my post this week at The Rubber Buggy. I love this Mo Manning stamp. I colored the couple with Copic Markers, coordinating them with the beautiful background papers from DCWV. This is today's post at Scrapbookpal.com. I wanted to create a pizza box from the Cricut Tags, Bags, Boxes and More 2 cartridge. The more I play with this cartridge, the more I like it! It's perfect for creating just the right packaging for all your gift giving needs. You can create any size boxes you want. THAT is the beauty of this cartridge. You can create a box that is all one piece (for a smaller box) or select both Section 1 and Section 2 to create a larger box. Since I wanted to see how big I could make the pizza box, I chose each to cut each section seperately. 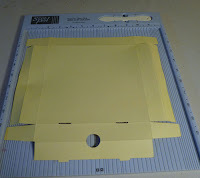 Using the fit2page function, I cut each section from cardstock at 11 ¼”. 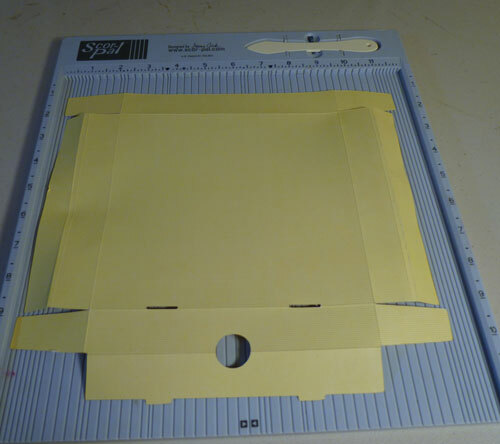 While that may seem large, remember that by the time you fold all your edges, you end up with a box approximately 7" square. Cut both Section 1 AND Section 2 from cardstock. Score and fold along the scored lines. While you can pre-score the box using the new Cricut Scoring blade before cutting the box, I prefer to use my Scor-pal, opting not to pre-score the box. Assemble box by adhering the 2 Sections together. 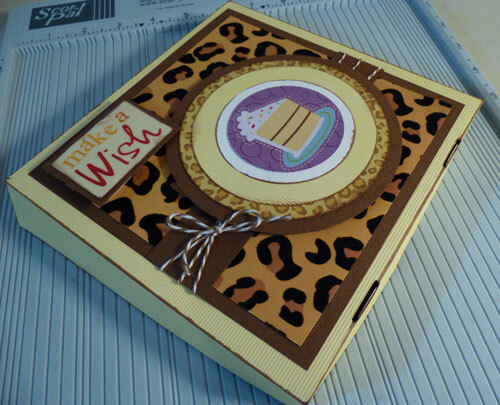 Cut brown cardstock 6 ½” x 6 ½” and cut pattern paper 6” x 6”. 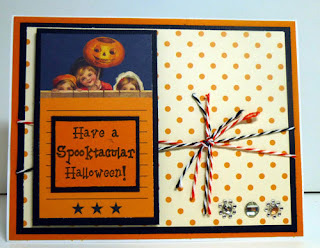 Cut a strip of cardstock 1 1/2" x 6 1/2" and place across this piece and wrap Twine around it. Adhere to the box top. Die cut 4 graduating circles using Spellbinders dies. 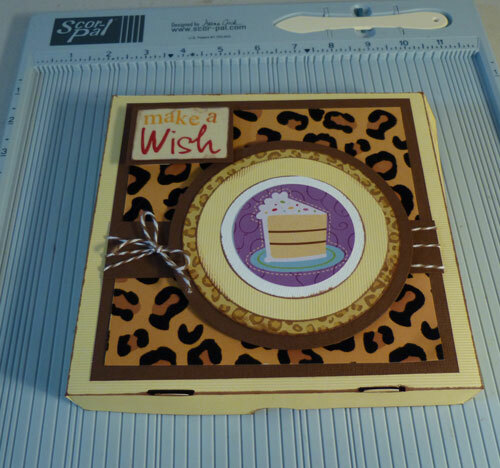 Now die cut the birthday cake from the pattern paper as the focal element. 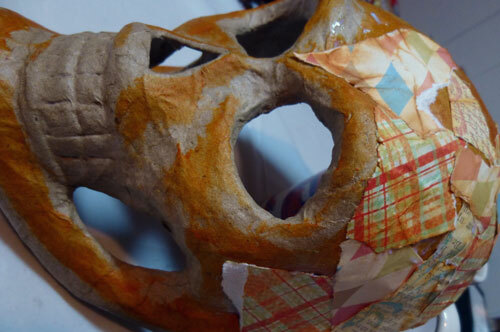 The entire circle set is added to the top with foam adhesives. Add a sentiment in the upper left with additional foam adhesives. 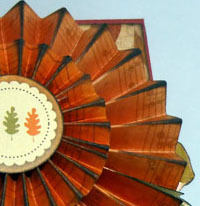 For the interior, cut pattern paper 6 1/2" x 6 1/2" and place on the bottom of the box. 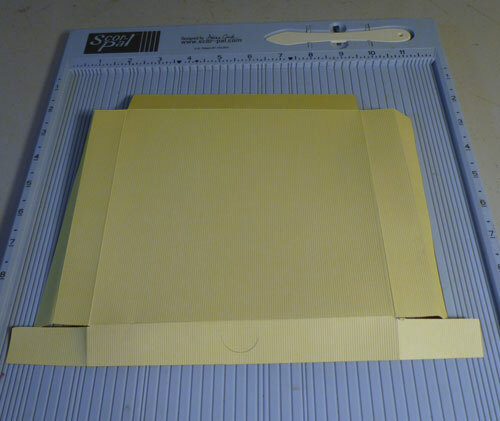 Cut brown cardstock 3" x 6 1/2" to create the pocket. 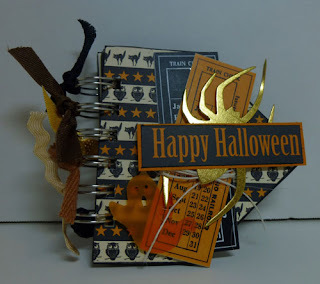 Add a strip of yellow cardstock across the center and die cut a scalloped edge using Spellbinders dies. Adhere to the box bottom. Place a sentiment on yellow and brown cardstock, then adhere to the center of the pocket using foam adhesives for dimension. Add a gift card or even some cash for the recipient. 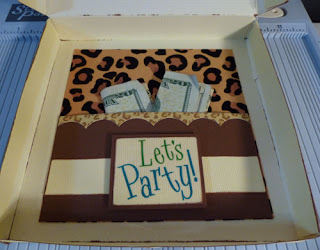 This is an awesome way to give someone a cash gift which can appear so tacky on its own. Don't forget to stop by the store to pick up this cartridge and all your supplies. Remember that shipping over $25.00 is free and most orders ship the same day. As a member of the Scraputante Design Team, I created a quick and easy gift tag from the awesome kit I received thi smonth. 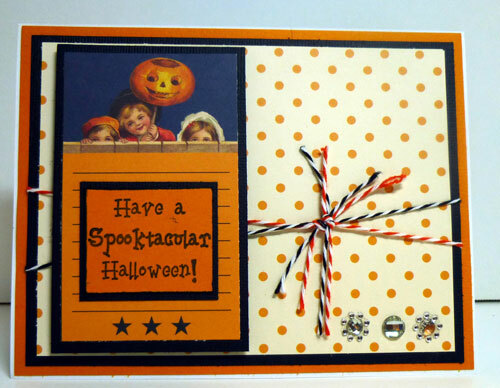 This kit had Jenni Bowlin papers, twine, die cuts, buttons and more. 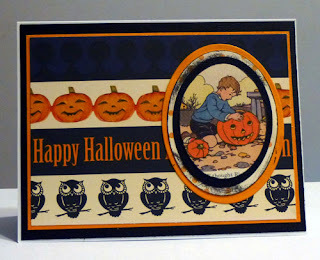 To create this tag, I cut a section of the pattern paper, matted it with orange cardstock, then again with black cardstock. A ribbon was added to the top and a button was added with some black twine. Add this tag to a gift bag for someone special this Halloween. It's challenge time at Cornish Heritage Farms and today is my day to host the challenge. I'd love you to create a project using fall/Halloween colors. 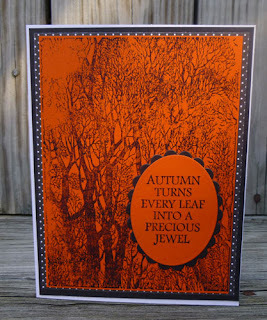 I stamped the Trees Backgrounder stamp in brown ink onto orange pattern paper. 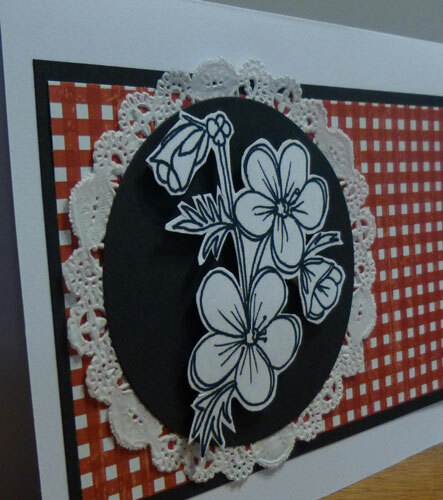 I then mounted it onto black and white pattenr paper and then black cardstock before adding it to my card. 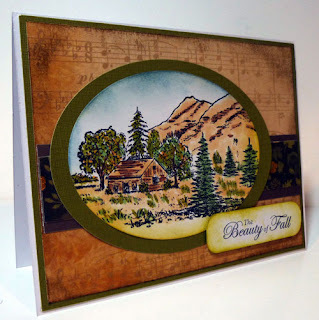 Backgrounder stamps are wonderful to work with because they cover most, if not all, of your card front. You can always cut it smaller than your card front or use a portion of the stamped image. 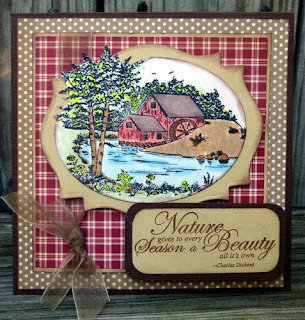 Stamping on colored pattern paper alleviates the need to "color" your image. 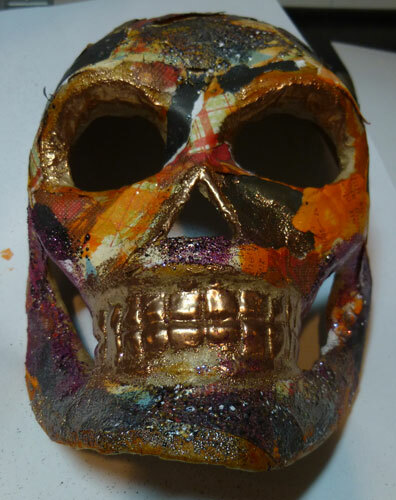 Don't forget to see what the others designers have created for this challenge. Submit your card to this challenge and you could win a prize. 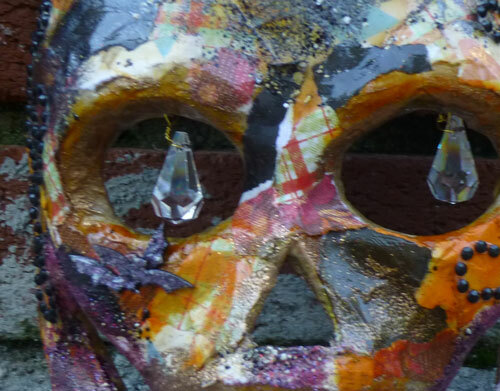 It's Monday, so it's time for another reveal at the Prickley Pear. Be sure to stop over and see what the designers have been creating! 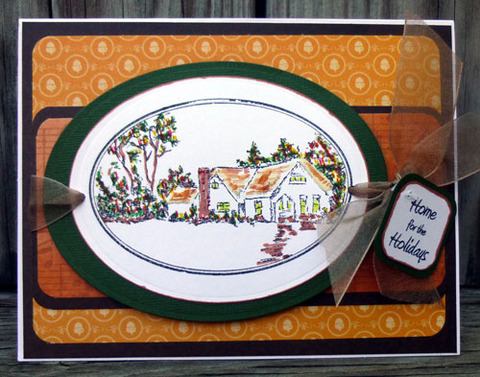 For today's card, I used an unmounted rubber stamp: Winter Cabin, and colored it with assorted Zig Markers. Using a sentiment from the Winter Scalloped Oval 3 Clearly Beautiful Stamp Set I created a small tag which I attached to the ribbon which surrounds the image. The papers are from the DCWV Autumn Melody Stack which is absolutely gorgeous!! 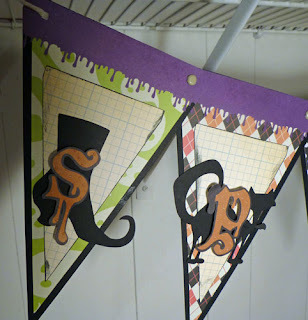 Good morning all, this week it's time for a blog hop between the designers of Scor-pal and DCWV. 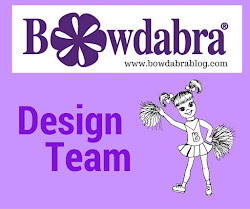 Both teams have some amazing projects to show you, so be sure to check out both blogs daily. 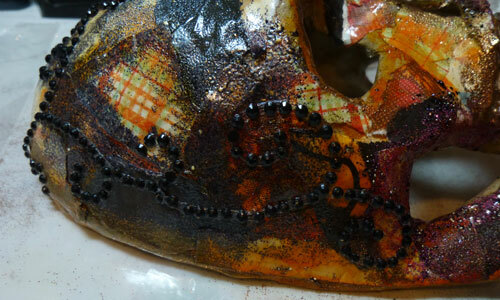 Here's a snippet of my project which will will appear on the Scor-pal blog later this week. Don't forget to stop by the blogs because there will be prizes!!!! It's time to get into a spooky mood!! 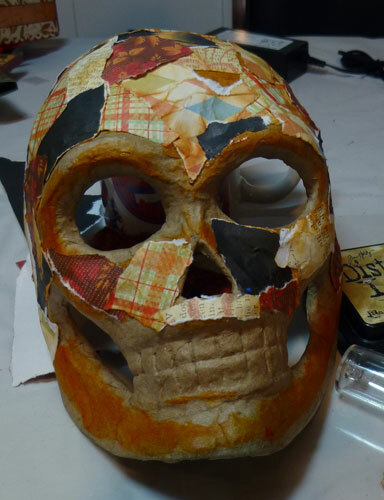 I found this paper mache skull in my local craft store and picked it up. I had no plan in mind, but thought it would be fun to work on at some point. My first Post as a DT member of Classy Cards'nSuch. 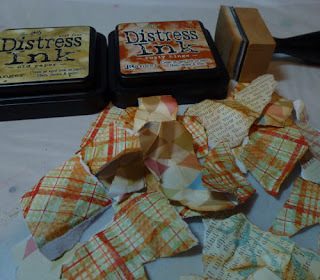 I used stamps from Justrite Stampers along with their coordinated Vintage dies which are available in the Store. I colored the Daisies with Zig Art & Graphic Twin Markers and added Clear Wink of Stella on top. Love the colors and the perfect amount of shimmer. Thanks for stopping by today and don't forget to head over to the Store and see all that Beverly has in stock! 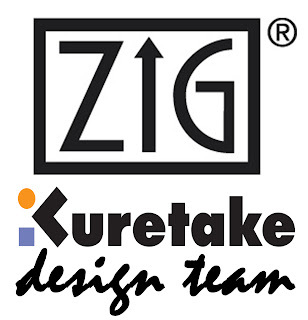 I am so excited to be a part of the Kuretake Zig Design Team . Check out these designers with whom I'll be working. Steph Ackerman this is ME!!!! It's going to be awesome!!!! This is my first post as a member of the Scraputante Design Team and I am super thrilled and excited. 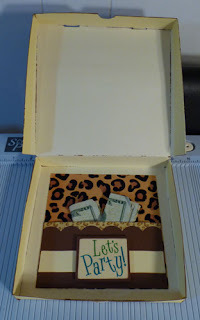 I received an awesome kit consisting of Jenni Bowlin papers, twine, die cuts, buttons and more. These are the cards I created. One of the elements of the pattern paper was this cute trio of kids peeking, so I used that as the focal point of my card, adding a sentiment on top. I matted the pattern paper with black cardstock, then wrapped several colors of twine around it before placing it on a base of orange. A few little gems finished off the card. I took another cute element and die cut it to fit the front of this card. Using left over pieces of pattern paper, I tore them and arranged them on the card front, then tied some twine. 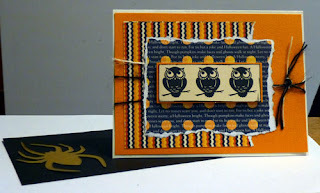 A small row of owls was matted and added with foam adhesives. I had this awesome spider so I added it to the front of the envelope. What's Halloween without spiders, right? Don't forget to check out the Store to see all the amazing products they sell. Hi everyone. 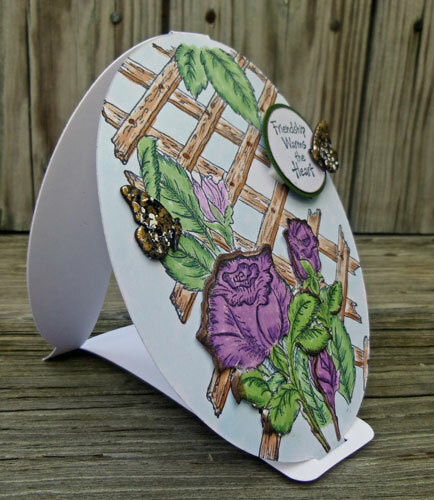 It's reveal day at The Prickley Pear and I'm excited to show my first card created with their wonderful stamps and coordinating dies. I used stamps from the Oak and Maple Leaf Clear Stamp set and the coordinating Oak and Maple Leaf Die. I love stamps with coordinating dies - you get the perfect die cut image every time. There are 6 leaf stamps and 4 phrases in this stamp set. I colored the flowers with Zig Brush Markers, then went over them with a Wink of Stella Clear Glitter Marker for a little shimmer. This card was definitely quick and easy to create. I used a pre-made card, added some fall papers and 2 die cut circles along with an embossed strip of white cardstock. Some string was tied around the card and the sentiment was tied in place. 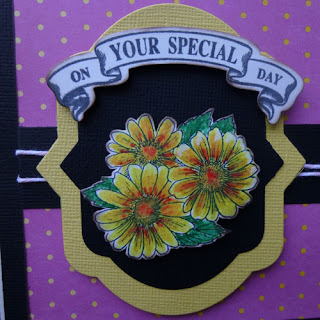 I inked around the edges of the flowers then added them to the card with foam adhesives for some dimension. Be sure to visit the Store and check out all the wonderful products in stock. It's a new challenge at Cornish Heritage Farms and Cindy has asked us to use red and white in honor of Thanksgiving in Canada. 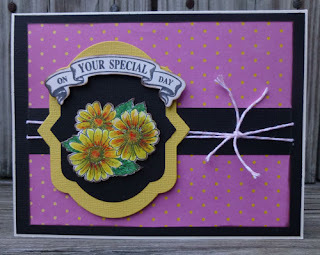 I used Buttercups digital stamp on my card. This digital image is very pretty and since I wanted it to be center stage, I left it white, but matted it on a black circle. Placing a white doily underneath helps focus your attention on the image. The red and white background paper is simple but effective in showcasing the image. I didn't add a sentiment because this card can be used for so many occasions - thank you, thinking of you, etc. I'm just waiting for the right occasion to come along! Thanks for stopping by and don't forget to check out all the new stamps in the Store. There are so many to choose from, including some beauties from Thomas Kinkade. This is my posted project at Scrapbookpal today. With Halloween just around the corner, it's not to early to start thinking about creating Halloween projects. 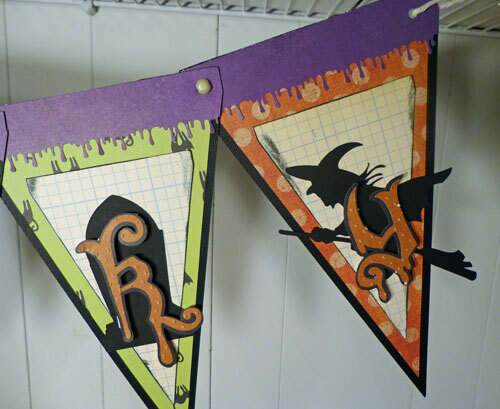 So pull out your supplies and create this Spooky Banner. 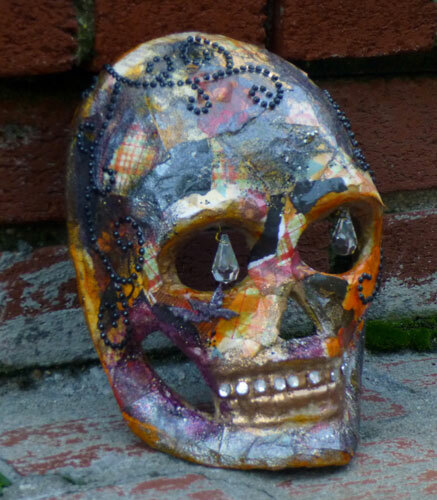 It's a perfect Halloween accent piece and can be created using any supplies on hand. Grab some scraps and start creating. 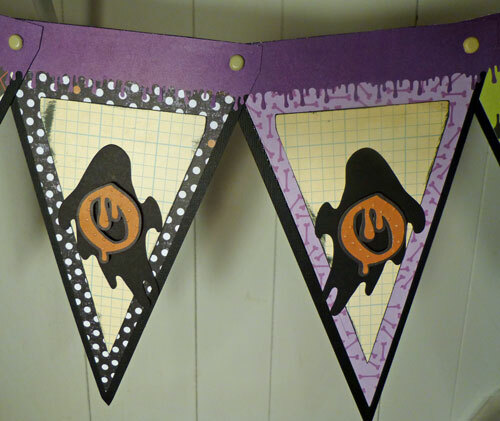 Bottom layer (Black cardstock) - 5 1/2"
﻿Second layer (pattern paper) - 5"
Third layer (pattern paper) - 3 1/2"
Using the Happy Hauntings cartridge, I cut the Halloween icons at 3 1/2"
The smallest banner layer was inked with black ink before adhering the layers together. Using a Martha Stewart punch, I created the top edge for each banner piece, cutting it to fit. I love the drippy effect, don't you? Using the Happy Hauntings Cartridge, I cut Halloween icons (without the layers) for each banner from black cardstock. For the "O" I used the same ghost cut, but flipped the second one so they appear to be looking at each other. 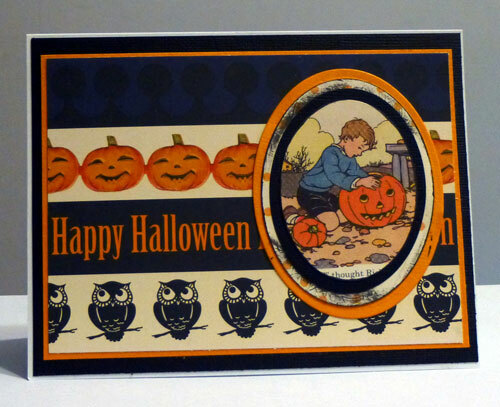 The letters were cut from the Happy Hauntings cartridge at 2 1/2" from orange pattern paper which were then embossed with a Cuttlebug Swiss Dots Embossing Folder. Black cardstock was used to create the shadow letters. Once all the elements were adhered to each banner, I punched holes in each side of the banner and added brads. In the two outer holes, I tied string so I could hang the banner. I have some awesome news!!!!!! I've been asked to be a member of the Prickley Pear Design Team. 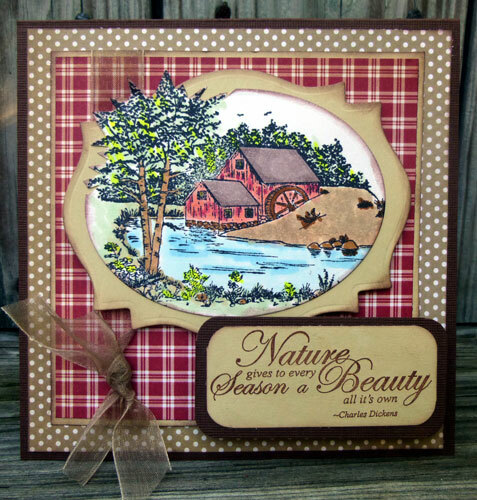 Prickley Pear has an amazing assortment of rubber and clear stamps as well as coordinating dies. 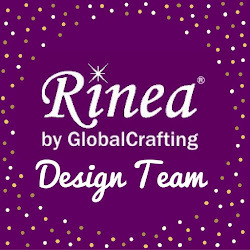 I LOVE stamps and dies, so I am totally thrilled to be working with these wonderful products and designers. 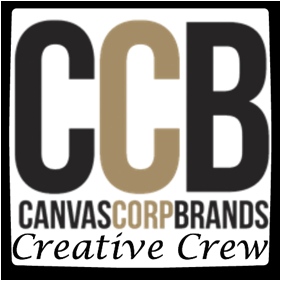 Check out this post of all the wonderful designers on the team and follow the blog for tons of inspiration. 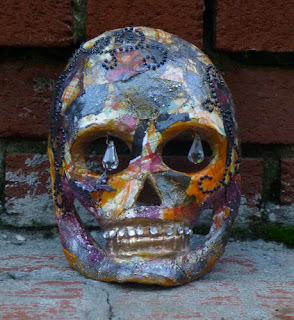 I am thrilled to be featured on the Clear Scraps blog today. Here's a little hint of my project. Welcome to World Card Making Day. 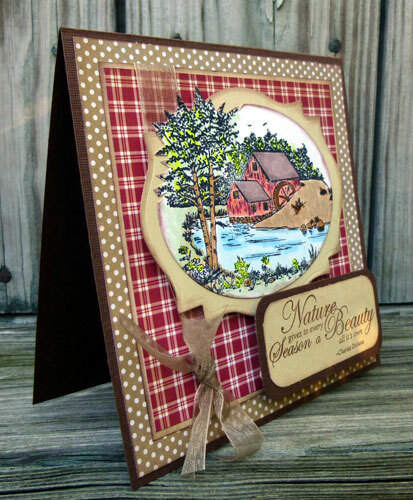 Today's card is a wonderful easel card from Globecraft Memories that has so many possibilities. 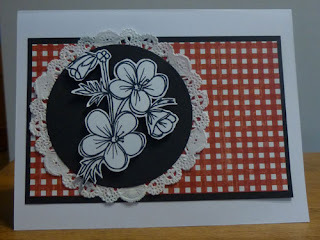 Using Heartfelt Creations stamp - Bella Rose Lattice Background - I stamped directly on the card front with Black Memento Ink. I then colored the image with Copic Markers. I also colored the background with B0000 for a soft effect. Since I also had the coordinating Classic Bella Rose stamps and coordinating Spellbinders Belle Rose dies, I stamped and die cut 3 seperate roses, also coloring them with Copics. For some dimension, I lightly inked them with ColorBox Donna Salazar Leather Mix'd Media Inx and used Glue Dots to adhere them to the card. 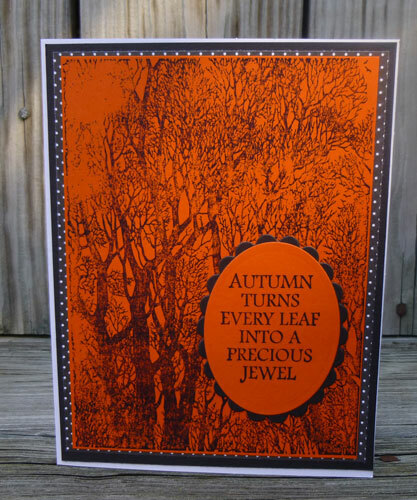 The sentiment is Hero Arts and was stamped with Black Memento Ink on white cardstock. 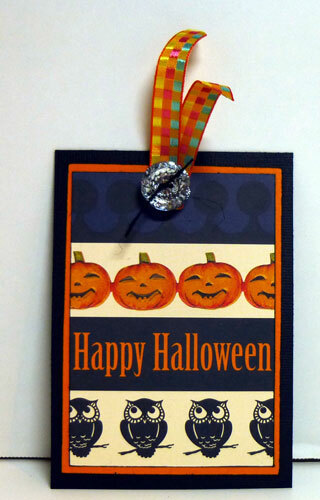 I used 2 sizes of EKSuccess circle punches and used foam adhesives to add the sentiment to the card front. 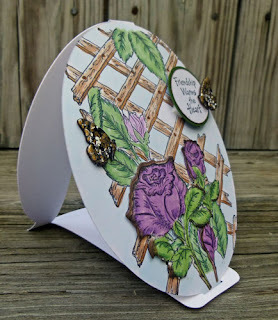 I wanted a few butterflies, so I pulled out Birds and Butterflies Card Decor by Globecraft Memories and used Temple Stone Enamel Powder and heat set. The card stands perfectly on it's easel and there is plenty of room on the back of the card or on the easel portion to write a note. Thanks for stopping by today and Happy World Card Making Day.